Six months later you find out the foundation is crumbling. The soil it was built on is sliding downhill. When it rains, it pours- onto your brand new couch. Duct tape is the only thing holding the beam in your attic above your head. That beautiful wraparound deck is being supported by a stack of tires. Your hose spout is placed directly above the fuse box. While we wish these were all exaggerations, every example above is an actual situation that skilled inspectors were able to catch; and the list goes on and on, but you get the point. If you’d had a home inspection, these would only be nightmares. But because you wanted to save a dime or two, these terrors will be on your mind night and day. 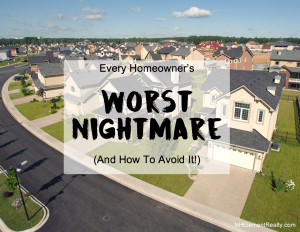 It’s every homeowner’s worst nightmare: making one of the biggest investments of your life only to find out you didn’t get what you paid for. It’s easy then to blame it on the previous homeowners, but whose fault is it really? Enter AmeriSpec- the company is one of NextHome Element Realty’s premier choices in home inspection services- and we’ll tell you why even our realtors use them for their own home purchases. It’s obvious why we, here at NextHome Element Realty, recommend AmeriSpec: we provide only the best for our clients, and won’t settle for anything less. Likewise, with AmeriSpec, you know you’re in good hands from start-to-finish, and able to walk into that gorgeous new home having either already fixed any issues or knowing just what steps to take next. It’s just another way we help you stay in your Element.